Guide on how to get 3 stars from TH9 vs TH9 or TH10 vs TH10 clan war attack using GoWiWi, GoWiPe, GoWiWiPe, Lavaloonion and Quatrolavaloonion. TH9 is when you can finally unlock all available troops in Clash of Clans, thus making all kinds of attack strategies possible. It’s good to be creative and use your own troops composition and attack strategy, but you will have to make sure you can make sufficient contribution to your clan during clan war because what matters the most is the amount of stars you can get from your opponents. Eventually you will need some better and more solid attack strategies such as GoWiWi, GoWiPe, Lavaloonion and Hog Riders. 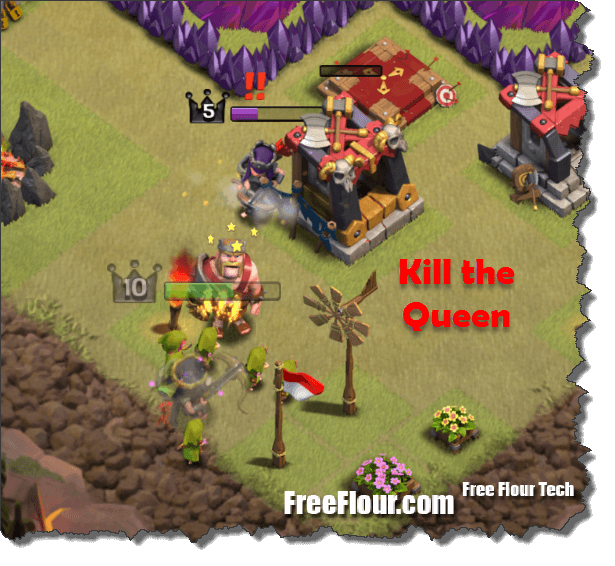 This guide will be featuring GoWiWi, Lavaloonion and QuatroLavaloonion attack strategies for clan war attacks. You can look for other attack strategies such as GoWiPe, Hog Riders and Dragon attacks listed in this page. GoWiWi stands for Golem, Wizard and Witch – an all ground attack strategy. It is very similar to GoWiPe in terms of troops composition and the method and sequence of dropping them on the battle field. The only difference is that it uses Witches instead of Pekka as its main pushing unit. Just because Witch is TH9 troop doesn’t make GoWiWi any better than GoWiPe. They are both as good. In fact, GoWiPe is much more suitable for compact bases while GoWiWi for loose bases. You can even combine pekka with witches in your troop composition, making it a GoWiWiPE. Well, let’s just focus on GoWiWi. For GoWiWi troop composition, you should have 2 heal and 2 rage spells, 8-12 Wall Breakers, 3 Golems (1 in your CC), 10-16 Wizards and 4-5 Witches. If you think you should and able to lure your opponent’s CC troop, replace 1 of your witch with 1-2 Hog/Giant and a few archers to do the luring and then use your witch, wizard and heroes to kill them. So, here’s how you are going to use the troops. 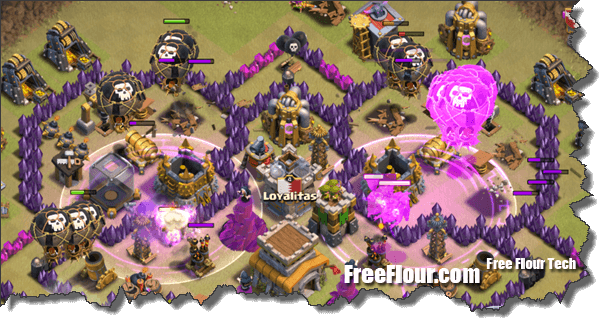 Drop your Golems far apart from each other, wide enough to cover all defenses attack range from the side you are going to launch your attack. Drop your Wizards behind your Golems. I do this by dropping 1 wizard on each of the exterior building. Drop a few Wall breakers to break the walls of where your middle Golem is. Look out for mortar and time them correctly before dropping your WB. Once the exterior buildings are cleared, you can then drop your Witches and Heroes to where you broke the first layer of walls. Drop Heal and Rage when their CC troops start hitting your troops. Drop your remaining WB to break the inner layers of walls. Apply remaining Heal and Rage as you see fit. It is important that you destroy the outside buildings before your drop your main forces so that you can funnel and create a path for your main force to push to the center of the base, instead of wondering around trying to clear up all outside buildings while taking full fires from the defenses. You can also drop 1 witch behind each of your golem who are tanking the left and right flanks to help destroy more defenses. 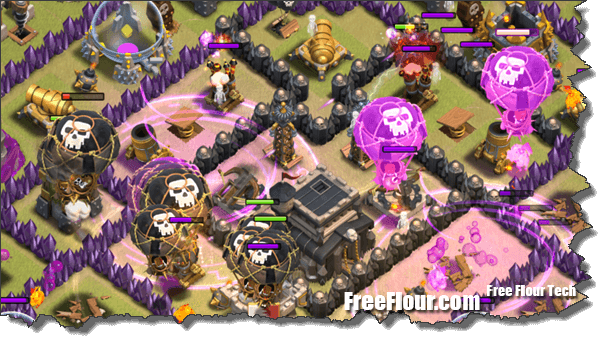 Your main objective is to get your troops to the center of the base as quickly as possible because that’s usually where the most deadly defenses are (such as XBow). Always focus on your witches’ HP. Keeping them alive is your key to success. Apply heal on them whenever necessary. What makes witches awesome is their unlimited number of skeletons. If they can be alive throughout the attack, you can have unlimited firepower. GoWiWi is most widely used in TH9 vs TH9 and TH10 vs TH10 attacks. Like many other clan war attack strategies, GoWiWi requires experience to succeed with it. You will get better as you play it. It will not guarantee a 3 star but you can easily get 2 stars from any TH9 bases. Lavaloonion stands for Lava Hound, Balloon (usually meant for Level 6 only) and minions. The word quatro simply means there will be 4x Lava in the troop composition instead of just 2 in the common lavaloonion strategy. This attack strategy used to be the strongest and the most widely used strategy before the implementation of air sweeper update. Well, many people have given it up because of how crazy air sweeper can slow down the balloon’s movement. You can, however, counter air sweeper by launching your attack from behind where the air sweeper is facing. You will need to choose base wisely because some smartly placed air sweeper can force you to trigger all the seeking air mines and air bombs even before you reach to the air defenses. 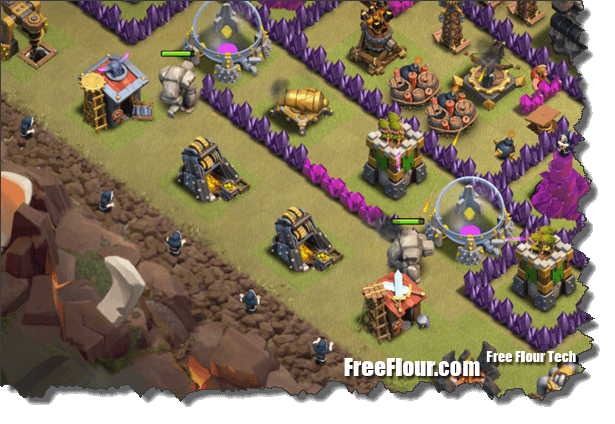 Pick base which have their air defenses placed very near to the air sweeper so they can immediately destroy it when it reaches the AD. Anyway, it is still a very much viable clan war attack strategy if you know how to use it properly. You will need 1-2 Heal spell, 2-3 Rage Spell, 2-4 Lava Hounds (get one from your clan mate), 18-25 Balloons, 10-15 minions and 10-15 Archers for the CC luring. Lure and kill the CC troops with the help of your heroes. This is very important because your balloons and lavas will not target the CC troops during the attack. Kill the queen if she is placed very near to the border of the base and can be lured. Queen is deadly to Balloons. If a base has its Queen in the middle and well protected, try not to attack that base. Another trick is to send a lava to the air defense that is placed very near to the queen and apply rage when your lava hound dies so that the lava pups can quickly take out the queen under rage effect. Drop balloons in a straight line from where you launch your attack, or 1-2 loons on each entry point (defenses) from a side (or two sides). Drop balloons first if the air defenses are too far away from where you can drop your troops (the red line). If the red line is very near to the air defense range, drop lava first instead. This is because if you drop your lava too early they would be dead before your balloons reach to the air defenses. 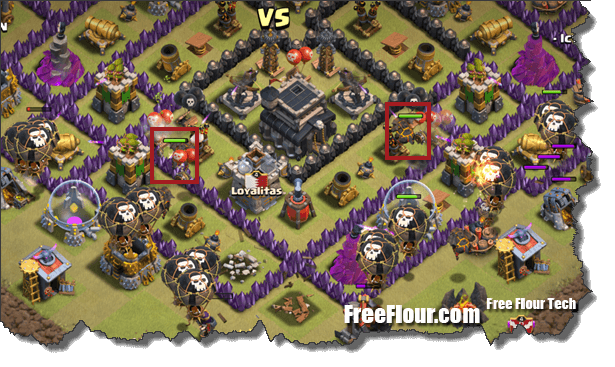 Drop your lava hounds one on each air defense from where you launch your attack. If you are using quatrolavaloonion, drop 2 lavas on each air defense. Drop your minions in a straight line just behind your balloons and lava hounds to start cleaning up the buildings behind. Apply Rage along the way for your balloons to quickly reach to the Air defenses. If you have 1 heal, reserve the heal for when your balloons are taking fire from the Wizard towers when they group up in pack. If you use 2 heals, what I usually do is to apply 2 heal spells at once (they stack on each other) on the Lava hounds to further lengthen their tanking time. Lavaloonion can succeed with flying colors or fail with zero star. You will rarely get 2 stars because balloons don’t attack town hall and when they die, your minions will die very quickly after them. Lavaloonion is still my favorite attack strategy despite the air sweeper. If you master this strategy, you wouldn’t even care about the air sweeper because they can be countered easily by spread out troop summoning. Following the troop deployment suggested above is entirely optional. This strategy is as flexible as using barbarians and archers. Different bases may need different orders of deployment. Use it as you see fit. We have more clash of clans attack strategy guides listed in this page: Clash of Clans Attack Strategy Tips and Cheat Sheets. If you like this guide, follow us on Facebook or Twitter to get the latest Clash of Clans tips and updates.